The Morpheo, Theault’s most luxurious model, is back. 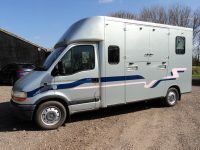 This innovative 3.5 tonne model is the result of years of rigorous testing and the cutting edge design maximises your safety and that of your horses, whilst offering a first-class travel experience. Each model comes with a bespoke luxury interior to match the elegant exterior. 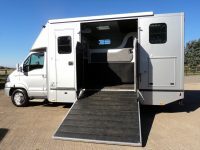 The Morpheo is unique in offering a changeable horse area, something not offered by any other horse box on the market. The stall lengths can be adjusted so the horses can stand either with the breast bar and anti-weave grill, or these can be moved to let them stand in a stud stall. Depending on each horse’s preference, the stalls can be set up identically, or in a combination to suits each horse, ensuring a more comfortable and safe journey. The Morpheo has an extended grooms’ area, which allows you to choose between a range of seating, tack storage and other storage options. The 4-seater Morpheo combines the practical aspects of horse transport with luxury features that emulate travel in a first-class cabin. Features such as an integrated sound system, heated leather seats, mood lighting an even a champagne fridge all combine to create a truly exceptional travel experience. Alongside your choice of Edition, you also have many options available to customise your bespoke horsebox.